Berries and leaves from Piper nigrum contain many compounds that exhibit beneficial properties for humans. Methanolic extracts, terpenes, alkaloids, flavonoids, and sterols are just some of the compounds that have been extensively studied by researchers in pursuit of medicinal discoveries. Studies have shown that extracts prepared from P. nigrum exhibit strong parasite inhibiting qualities as well as the promotion of tissue health through a handful of pathways. 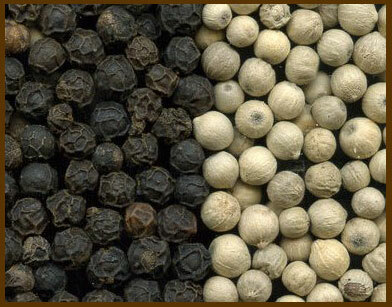 Testing has yielded extensive evidence that black pepper is a fierce weapon against many notable parasites. Extracts prepared from P. nigrum are capable of reducing or eliminating infection from such notable parasites as malaria (genus Plasmodium), Leishmania, and sleeping sickness (genus Trypanosoma). Other evidence has been shown that reinforces some long standing historical claims to the medicinal value of black pepper. Evidence of use as an antiinflammatory, analgesic (painkiller), and antioxidant dates back as early as ancient Indian and Egyptian cultures more than 3,000 years ago. Extracts from P. nigrum have also shown anti-cancerous / cytotoxic facilitation in recent studies. Piperene is a potent chemical which in addition to the aforementioned properties, also promotes thermogenesis in humans. Thermogenesis is the heat producing catabolism (breakdown) of fats in the body. Some other organisms which exhibit similar medicinal properties are albacore tuna, foxglove, white willow, eucalyptus tree, peppermint, and many others!